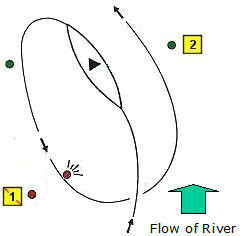 A paddler Negotiates Gates 1 (downstream) and 2 (upstream) in the right order and in the right direction, but then drifts through Gate 1 in an upstream direction and touches the left pole with his/her shoulder. What (if any) is the penalty on each gate? Why? Gate 1: 0 The paddler has negotiated the gate correctly. The "wrong way" passage came after he/she has negotiated Gate 2. Gate 1 is now "dead" and it doesn't matter if he/she goes through it again, in any direction, or touches it. There is no penalty. Gate 2: 0 The paddler has negotiated the gate correctly. There is no penalty. A paddler is swept down to Gate 2 before negotiating Gate 1 and turns back, too late to avoid his/her head passing through the gate line. 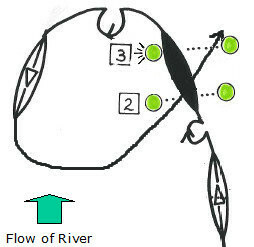 The paddler goes back to upstream Gate 1 and negotiates it, but in doing so touches the left pole with the tip of the paddle. He/she then does Gate 2 correctly. Gate 1: 50 Crossing the Gate 2 gate line "kills" all preceding gates, so a 50 on Gate 1 (which cannot be cleared) has been incurred before the paddler even gets to it. The touch doesn't matter, because 50 is the maximum penalty on a gate. Gate 2: 0 Coming back through the gate line could have incurred a 50 penalty, but because the paddler's first and last passages through Gate 2 were both in the right direction there is no penalty. Downstream Gates 2 and 3 are set quite close together. Approaching Gate 2, a paddler capsizes and is carried though both gates upside-down. The upturned hull touches the tip of one of the poles of Gate 3 as it passes through. The paddler then rolls up, paddles back and does both gates correctly. Gate 2: 50 Negotiating the gate capsized incurs a 50 penalty. The paddler cannot clear the penalty by renegotiating the gate because he/she has already passed through Gate 3, and Gate 2 is "dead". Gate 3: 2 Negotiating the gate capsized incurs a 50 penalty. 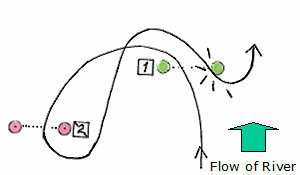 The second passage through gate 3 clears the 50 penalty for the capsized passage, but the touch penalty on the first (capsized) passage stands.